Father all-powerful, your gifts of love are countless and your goodness infinite. On Thanksgiving Day we come before you with gratitude for your kindness: open our hearts to concern for our fellow men and women, so that we may share your gifts in loving service. We ask this through our Lord Jesus Christ, your Son, who lives and reigns with you and the Holy Spirit, one God, for ever and ever. Amen. From time immemorial St. Catherine had been venerated at the monastery on Mount Sinai when, in the fifteenth century, the monks discovered her body. Legend has made of her a young Christian of Alexandria who rejected the advances of the Emperor Maximinus and routed a meeting of learned men gathered together to induce her to deny Christ. This feast was restored to the calendar in 2002. Catherine, virgin of Alexandria, devoted herself to the pursuit of knowledge; at the age of eighteen, she surpassed all her contemporaries in science. Upon seeing how the Christians were being tortured, she went before Emperor Maximin (311-313), upbraided him for his cruelty, and with convincing reasons demonstrated the need of Christian faith in order to be saved. Astounded by her wisdom, the Emperor ordered her to be kept confined, and having summoned the most learned philosophers, promised them magnificent rewards if they could confound the virgin and turn her from belief in Christ. Far from being successful, a considerable number of the philosophers were inflamed by the sound reasons and persuasiveness of Catherine's speech with such a love for Jesus Christ that they declared themselves willing to offer their lives for the Gospel. Then the Emperor attempted to win her by flattery and by promises, but his efforts proved equally fruitless. He ordered her whipped with rods, scourged with leaden nodules, and then left to languish eleven days without food in prison. The Emperor's wife and Porphyrius, general of the army, visited Catherine in prison; her words brought both to Christ and later they too proved their love in blood. Catherine's next torture consisted of being placed upon a wheel with sharp and pointed knives; from her lacerated body prayers ascended to heaven and the infernal machine fell to pieces. Many who witnessed the miracle embraced the faith. Finally, on November 25 Christ's servant was beheaded (307 or 312). By the hands of angels her body was carried to Mt. Sinai, where it was interred in the convent which bears her name. Patron: Apologists; craftsmen who work with a wheel (potters; spinners; etc. ); archivists; attorneys; barristers; dying people; educators; girls; jurists; knife grinders; knife sharpeners; lawyers; librarians; libraries; maidens; mechanics; millers; nurses; old maids; philosophers; potters; preachers; scholars; schoolchildren; scribes; secretaries; spinners; spinsters; stenographers; students; tanners; teachers; theologians; turners; unmarried girls; wheelwrights. Symbols: Wheel set with sharp knives; broken wheel; sword; crown at her feet; hailstones; bridal veil and ring; dove; scourge; book; spiked wheel; woman strapped to the spiked wheel on which she was martyred; woman arguing with pagan philosophers. 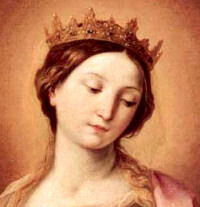 St. Catherine was invoked by young girls seeking husbands. If you have children, you could use this feast to discuss the qualities of a good spouse. You could bake St. Catherine's wigs and have your discussion as part of the fun (a spoon full of sugar). Read more about St. Catherine. St. Catherine's remains are in St. Katherine's Monastery on Mt. Sinai. The Monastery, a 1,600-year old fortress at the base of Mt. Sinai, is inhabited by Coptic monks (not in union with Rome). Inside the chapel is believed to be the Burning Bush, through which God first appeared to Moses. Read more about the history of the Church of Alexandria and the Council of Chalcedon where the Coptic Church broke from the bark of Peter and pray for the reunion of all Eastern Churches under the Pope.